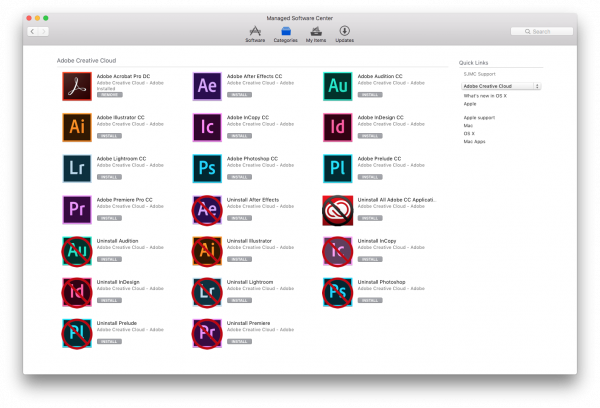 Adobe Creative Cloud is available through the Managed Software Center application in your Applications folder. When you open Managed Software Center all applications available can be seen. Selecting the drop down menu on the right of the window and choosing Adobe Creative Cloud will show you just the Adobe Creative Cloud programs. To ensure previous versions of Adobe Creative Cloud are removed it is recommended to run one of the uninstallers first. These items named Uninstall… will remove all versions of the selected application. To remove all versions of all Adobe Creative Cloud applications click the install under Uninstall All Adobe CC Applications. Clicking install on any of the uninstallers does not actually install anything, it starts a script that performs the uninstallation. Note Adobe Acrobat must be removed through the uninstaller in the application folder on your Mac. To install the new version of an application all is needed is to click install for the appropriate application. A screenshot of the Managed Software Center is below.